Description: Construction of a new large-diameter trunk sewer main (sanitary trunk) in order to meet the existing service requirements of Calgary’s Northwest Quadrant Sewerage System, which was approaching capacity and inadequate for future growth plans for the city. Ward & Burke designed and constructed two caisson shafts, up to 20m deep on each side of the Bow River and both were constructed without the use of active dewatering. The construction of the shafts was undertaken simultaneously and despite severe weather conditions, of up to minus 20 degrees Celsius, both were successfully completed. Two 1200mm ID microtunnels, 207m long each [414m total distance] were driven from the launch shaft to the reception shaft, under the Bow River and the Trans-Canada Highway, each taking approximately 2 weeks. Tunnelling operations were operated on a 24/7 basis. No issues were encountered during tunnelling and the Herrenknecht AVN 1200 series microtunnel boring machine handled the abrasive glacial soils, due to Ward & Burke adopting and installing an aggressive mixed face cutterhead onto the MTBM prior to the MTBM being launched. Following the completion of the twin tunnels, Ward & Burke installed the steel riser piping and subsequently constructed the North and South permanent manhole chambers. Ward & Burke designed and constructed ten caisson shafts, average 15m deep, on the western limits of the Bow River, and parallel to 16th Ave, in the City of Calgary, which were constructed without the use of active dewatering. In order to complete the project within schedule, Ward & Burke called upon two Herrenknecht AVN type microtunnel boring machines and completed 1100m of 1500mm ID microtunnel, and 800m of 1800mm ID microtunnel. No issues were encountered during tunnelling and both Herrenknecht AVN series microtunnel boring machines handled the abrasive glacial soils, due to W&B adopting and installing an aggressive mixed face cutterhead onto the MTBM prior to the MTBM being launched. Following the completion of the microtunnels, Ward & Burke constructed the access chambers, and utilised a specialised custom hydraulic flume unit to undertake the construction of “live” sewer network tie-ins, without disrupting sewer flows. Ward & Burke also coordinated the construction of the 13th Ave. Road and electrical installations to meet the requirements of the contract. 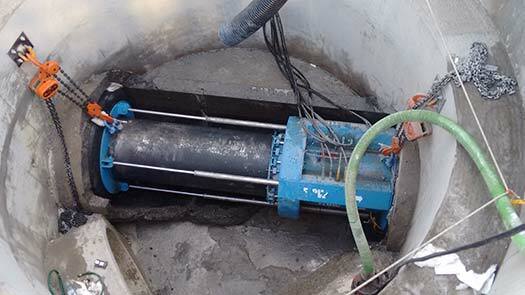 The microtunnel lining used was reinforced concrete pipe, which was designed specifically to suit the project. Ward & Burke developed a unique pipe joint transition for the project which allowed the reinforced concrete pipe to connect to the steel rising mains, saving time on the programme. This was one of the many time-saving factors which lead to the contract being completed well ahead of the originally planned completion date. Ward & Burke used state-of-the-art tunnelling machines from Germany to complete the work tat were very well matched to the site-specific requirements. This demonstrated the benefits of correctly matching technology to site conditions, especially when facing the mixed, complex soil conditions such as those that characterize the regional geology in the Calgary area. Using a trenchless construction technique in a built-up environment also demonstrates social responsibility by completing the project in a fahion that not only benefits the future growth of northwest Calgary but was least disruptive to the directly affected community, businesses and the environment. It was also fiscally responsible in meeting both short and long-term technical objectives for the infrastructure in the most cost-effective manner possible. Due to the ability of Ward & Burke to deploy two state-of-the-art microtunnel boring machines, the project completion was achieved 5 months ahead of the Clients’ schedule. The existing ground conditions comprised of glacial soils which presented a challenge for microtunnelling techniques due to their abrasive nature and tendency to cause high levels of wear to the TBM cutterhead. 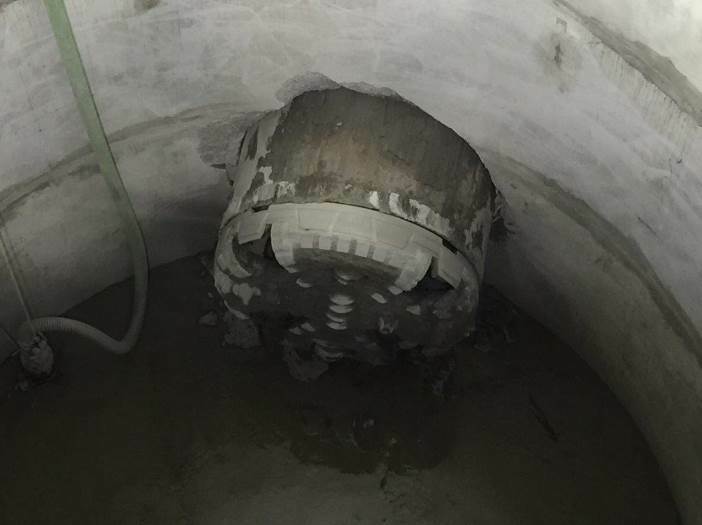 Ward & Burke overcame this challenge by the use of a mixed-face cutterhead, which enabled the drives to be completed without disruption and negated the need for interventions on the TBM during works.